Stampin' Up is now offering retired inventory at a huge discount! The Clearance Rack, a new "aisle" in the on-line store is now available. Just log on to my web site, www.susanlacroix.stampinup.net , hit the shop now button and go to the Clearance Rack! Quantities are limited and will be removed once it is sold out. Additional items will be added on an on-going basis so check back often to see newly discounted items! At every Open House we offer a free Make and Take as our way of thanking you for coming. This card uses the Yuletide Christmas stamp set found on page 22 in the Holiday Mini. I just loved how the spiral note book was stamped and decided to CASE it for our Make and Take. (CASE stands for Copy And Share Everything). We used Kraft, Very Vanilla and Real Red card stock, a strip of Merry Moments designer series paper; Scallop Edge, Scallop Oval and Wide Oval punches; Chocolate Chip 1/4" Grosgrain ribbon; Close to Cocoa Classic Ink for the oval wreath and Chocolate Chip, Old Olive and Real Red markers for the greeting. If you would like to book a workshop, you and your friends can make this fun card! I am having so much fun with the Build-A-Bear stamps and dies! Here is the display board we put together for our Holiday Mini Catalog Open House this weekend! I've included a close up of the Halloween Bears as well. These will look great on scrapbook pages or gift bags! You can run magnetic sheets through the Sizzix with the Build-A-Bear die and make paper doll bears as a gift! Lots of things! I am home from Illinois. It's always bittersweet when have to leave my grandbabies - I love spending time with my daughters and their families but I am also glad to be home! Julie & I finally got some stamping time in yesterday before heading to the airport! I have several cards that I need to make and while I didn't get them all done, I did get a start on them! Two of my stamping friends are quite ill and I made this card to send to them. This flower was fun to make! This card was made using the following: Crushed Curry, Chocolate Chip, Dusty Durango and Whisper White card stock, For All You Do and Teeny Tiny Wishes Stamp sets, Old Olive and Chocolate Chip Classic Ink, Old Olive 5/8" grosgrain ribbon, Scallop Edge, Modern Label and Word Window and 5 Petal Flower punches and 5/16 Jumbo Brad. Today is my grandson Thomas' 6th birthday! It is rare that I am able to spend the day with my Illinois grandchildrens birthdays so I am thrilled to spend this special day with him! And of course I stamped his birthday card and envelope! Supplies used to make Thomas' card: Crazy for Cupcakes and Teeny Tiny Wishes stamp sets; Whisper White card stock and Pumpkin Pie card stock; Tempting Turquoise, Pumpkin Pie, Old Olive and Pixie Pink Markers; Basic Black Classic Ink; Old Olive 1/4" grosgrain ribbon, Word Window and Modern Label punches & designer series paper from the Sunny Day Simply Scrappin' Kit. I am off to spend a few days with my daughter and her family so I may not be posting for a few days. The card I am posting today was made by a Canadian demonstrator I met in the airport heading off to Convention. The card is made using Kraft card stock and the Level 3 Hostess set Lovely Flowers. It is stamped with Black Stazon and watercolored with Rich Razzleberry, Melon Mambo and Bermuda Bay. The boxes around the stamped images are drawn with the Basic Black marker and white gel pen. The Crushed Curry polka dot ribbon is tied on to the front of the card using the Slit punch. We made several cute projects in Cincinnati this past weekend. They will all be on display at my Holiday Mini Catalog Open House but thought I would share this cute 8 x 8 scrap book page. The Open House is on Friday, September 25 from 7:00 pm - 9:00 pm and Saturday, September 26 from 10:00 am - 2:00 pm. This adorable little Halloween box was made for me by Pat M, a friend and customer! She brought it over yesterday and I asked her if I could post it on my blog! She used the Stampin' Up! Fancy Favor die and Basic Black card stock and a jack-o-lantern sizzlit. Even though it's still pretty warm outside, Fall will be here in just a week or so! This card can be used for several occasions - from Birthdays to Thanksgiving! The large leaves are die cut using the Sizzix Big Shot and the Leaves #2 die. The background leaves and the greeting are from the Leaf Lines stamp set and the designer series paper is Autumn Traditions. I just love how are card stock coordinates with the designer series paper! The colors of card stock used in this card are Elegant Eggplant, Ruby Red, More Mustard and Sahara Sand. 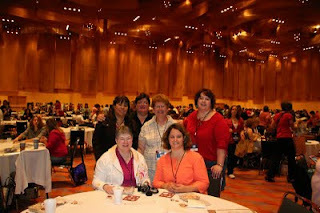 We are back from the Cincinnati Regional Seminar and a fun time was had by all! I have to say it was one of the best Regionals I have attended! I thought I would share just a few photos with you. 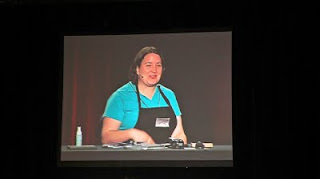 Shelli Gardner (Co-founder and CEO of Stampin' Up!) always has time to visit with demonstrators! I am so proud of my daughter (and upline) Julie. She was one of the presenters on stage! She did an absolutely fabulous demonstration of a Magic Card! Look for a future posting on this fun project! 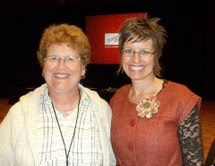 One of the highlights of any Stampin' Up! event is swapping! Here is the card I took to swap! We're off to Cincinnati on Friday for our Stampin' Up! Regional Seminar! It's kind of like a mini Convention - there will be presentations, product demonstrations, display boards, make and takes. One of the fun things the Sparklers will be doing is what is called a Shoe Box swap. Each person designs a card or project and prepares all of the supplies for it for each person. Then we sit around a table and pass the boxes around and make the project in each box. I thought would share my Shoe Box swap with you. Supplies used: Night of Navy, Whisper White and Brushed Silver card stock, Night of Navy Classic Ink, Platinum Shimmer Paint (Holiday Mini), Serene Snowflake and Four the Holidays (both from the Holiday Mini), Rhinestone brad, Stampin Dimensionals and the Eyelet Border Punch. Kim Peck demonstrated this fun technique several months ago. Take a 2 5/8' x 2 5/8" piece of card stock and center the Eyelet Punch on each side of the square. This will leave you 2 pieces - the frame and the center piece. Use them separately or together! I applied the Shimmer Paint to the snowflake stamp with a dauber. I haven't posted for several days - it's been a really busy week! So tonight I thought I would share a bit of Hostess Club with you! Donna, Sandie, Donna and Caroline are busy working on one of the projects! Glynis holds her finished pumpkin bucket! 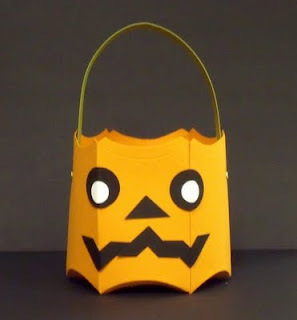 This cute pumpkin bucket was made using the pillow box Sizzix die, photo corner punch and circle punches. Thank you fellow Stampin' Up! demonstrator Kim Put! Laura shows off her completed card! Host a Workshop in September and you can have anything in the Holiday Mini Catalog for only $10! This offer does exclude the hostess sets in the Mini Catalog and the My Digital Studio software. I still have a few dates left for workshops and I would be happy to help you earn this terrific bonus! Trick or Treat - Give Me Something Good to Eat! Don't tell my grandchildren! I am sending each one of them one of these cards filled with Halloween M&M's! 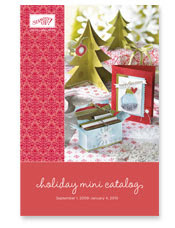 The stamp set, Sweet Centers, and the Sweet Treat Cups are in the Holiday Mini Catalog. The "Trick or Treat" greeting is from Holiday Best, a level 1 Hostess Set from the 2009 -2010 Idea Book & Catalog. Speaking of the Holiday Mini, you can now order from it! Feel free to give me a call or go to my website and hit the "shop now" button! There was apparently an issue with getting these mailed out from the printer. If you haven't received your copy of the Holiday Mini Catalog yet, check it out on-line!